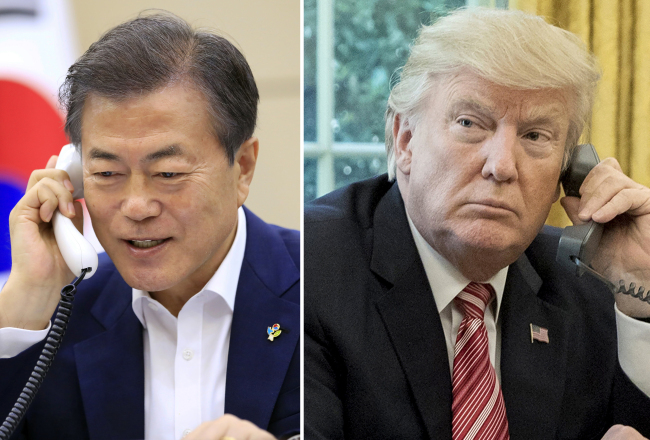 South Korean President Moon Jae-in said Monday it would be a “great gift” for US President Donald Trump’s birthday if his summit with North Korean leader Kim Jong-un is successful, Cheong Wa Dae said. During a phone call with Trump, Moon credited Trump for his “bold decision” and “courageous leadership” to hold the historic summit with North Korea scheduled for Tuesday in Singapore. The two leaders also discussed the declaration of an official end to the Korean War during the 40-minute call, Cheong Wa Dae added. However, the presidential office declined to reveal details of their discussion. “If the US-North Korea summit is successful, it would be a great gift for not only people around the world but also President Trump’s birthday on June 14,” Moon was quoted as saying by Cheong Wa Dae. South Korea to cooperate in implementing the results of the summit.